Contributor Paul gives us a rundown of the latest episode of Arrow, and includes his thoughts as well. “I want you to become the next Ra’s Al Ghul” blurted Ra’s when Oliver was at his mercy. Ra’s then gave Oliver the primer on The League of Assassins and how as the next Ra’s Oliver would have unlimited resources to make his quest global. To try to sway Oliver to take the offer, Ra’s prophesied that Oliver was destined to be alone and that the city he loves, as well as friends and loved ones, would turn on him: hated, hunted, and killed. Finally Ra’s showed Oliver the Lazarus Pit and explained how it has extended his life and kept him strong. The Ra’s and Oliver exchange in the first part of the episode was well paced, even if it was another plot taken from the classic Neal Adams Batman lore. Ra’s pitch is so strong that Oliver strongly considers taking the offer. Matt Nable as Ra’s was spectacular again and I do dare say he’s been a better Ra’s than Liam Neesom. The only problem with Ra’s Al Ghul this season is that he hasn’t been seen enough, and instead of Ra’s being a true force of nature (maybe a plot to wipe out power across Starling City as part of his revenge for Sara’s death), he’s been the boogeyman everyone fears without a true show of his power at it’s worst. Unfortunately for the rest of the episode was poorly paced and felt. Thea’s poor me plot is getting tiresome. She let Nissa out of the cage and practically begged Nissa to kill her. Is this really the girl who spent months training to be stronger? She winds up taking her pity party to Roy at the end of the episode. Poor Roy really was nothing more than a chess piece this episode and used only to fight the bad guys and be Thea’s safe harbor. It makes me cringe to think she’s going to be on Team Arrow soon as one of his partners. One of the only well-paced and heartfelt moments of the episode that Ra’s wasn’t in was when Captain Lance told off Arrow for not telling him that Sara had been dead for awhile now. His anger is completely justified. Lance took big risks helping Arrow in many episodes and trusted him, even betraying his oath to uphold the law to help Arrow because he trusted him. Felicity and Diggle did not appear much in this episode besides to tag team Oliver, telling him he’s insane if he takes Ra’s offer. Oliver does discover that Felicity is dating Ray Palmer and later throws it in Oliver’s face that it’s his fault that they aren’t dating. Felicity has become a lesser member of Team Arrow due to the fact that she’s helping Ray Palmer become the Atom. Nyssa confronts Ra’s with her rage over why Merlin is still alive. They have a heated exchange that gets worse when Nissa learns that Oliver is to be the next Ra’s. She refuses to accept his decision and feels cheated over the loss of her birth right. Nyssa winds up back in Starling City, offering to train Laurel. Murmur attacks the police and a wild gun fight ensues that leads to Team Arrow to save the day. However Murmur escapes, his fate left up to the writers of the show whether or not they want to bring him back. Where The Flash creative team took a lame villain in the Weather Wizard, in my opinion, and made him cool, Arrow’s creative team took a lame villain in Murmur, in my opinion, and made him completely boring, one dimensional and totally lifeless. 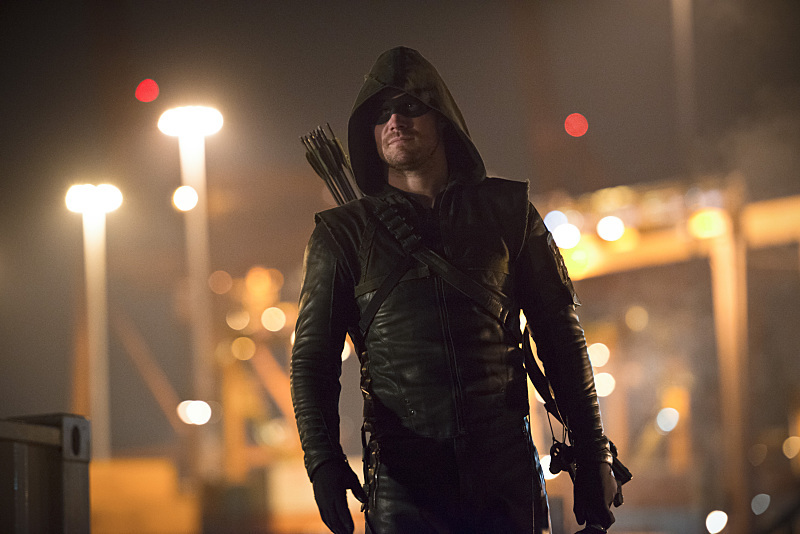 Oliver does make a decision in regards to the offer from Ra’s al Ghul and the consequences of that decision are already being felt by Arrow and those in his life, as the ending of the episode was powerful. Overall, on a scale of 1-10 I give this episode a 4. Arrow returns this Wednesday at 8/7c on the CW!